Many kitchen remodels start out with spaces consisting of little more than four walls and a door. The idea is that the spaces will be finished to meet the specific needs of each homeowner. The process of finishing this raw space is known as the "build-out." There can be extensive negotiations between the electrical specialists at Handyman Electric, LLC and you, the homeowner, which create a blueprint for our electrical contractors to follow. Handyman Electric, LLC has completed many kitchen remodling projects at residential properties throughout Spokane, Spokane and the surrounding areas. We understand that you need to open your kitchen back as quickly as possible to start living normal life again. We keep this at the forefront of our mind and act accordingly. We stay on schedule and make sure we find solutions for any issues before they affect your project. 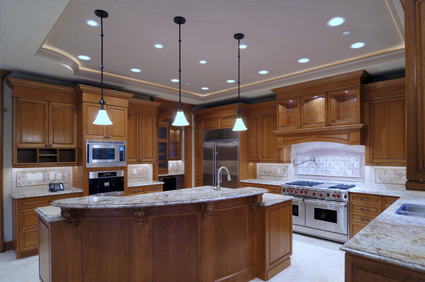 Our specialty is in residential kitchen remodels. It is our goal to provide outstanding customer service and deliver quality workmanship that will stand the test of time. If you need help with your kitchen remodel, give the experts at Handyman Electric, LLC a call today at 509-993-0303. Our residential clients appreciate our detail-oriented focus; our professionalism; and our ability to coordinate tenant electrical remodeling projects with time sensitive deadlines. Handyman Electric, LLC will finish your electrical project on time, within budget, and with professional craftsmanship. Our tenant build-out electrical contractors will manage the project from start to finish, providing exceptional service and complete peace of mind.